So you have a newborn baby - it certainly is a bit of a blur in the first 6 weeks when trying to manage a newborn. Quite often you find your baby crying, which causes great distress to you as a parent and you feel quite helpless when trying to solve your baby’s crying. The best advice I can give you on how to manage and reduce the amount of crying your baby does is to establish a routine and then watch and listen for your baby’s cries and get to know the different cries for the different reasons. Watch and listen and you will soon pick it up, if you have a routine to guide you. The joy of a new baby is certainly special and something that all new parents experience. However, a lack of sleep is also part of having a new baby and new parents notoriously get very little sleep, if any at all. Fortunately, there are some strategies and tips to help new parents get some sleep when the new baby comes. Of course, with a baby you will never get an over abundance of sleep, but these tips from Feed My Mind will help you at least get enough sleep to keep your sanity. When the baby starts crying both parents generally wake up, even if only one attends to the baby. However, in the first couple of months both parents might get up each time the baby cries. This will lead to a lack of sleep for both parents. The best plan is for mom and dad to make a plan of who will get up when to comfort the crying baby. Generally, taking turns is really the best option and will help everyone get just a little more sleep. If you are caring for the baby and are tired and the baby goes to sleep then you should take a nap as well. This will allow you to get some much needed sleep. So, whether the baby naps in the morning, afternoon, or early evening you should also get a little rest because you never know when the baby might wake up. I certainly agree, when baby is asleep, forget the washing, the dishes the endless jobs, take the phone off the hook, a note on the front door and lie down yourself, especially if breastfeeding, rest is certainly needed. Frequently when you have a new baby there are plenty of people willing to help from parents, siblings, friends, and other family members. So, when you really need to get some sleep just accept some of the help that is being offered. Having your mom care for the baby just a couple of hours will allow you to get some much needed sleep. The baby should sleep in the nursery and not with the parents. Many times it is tempting to allow the baby to sleep with the parents, but this is not healthy for the child or the parents. So, put the baby to sleep in his crib in the nursery. Then, when the baby cries one parent can easily go attend to the baby without disturbing the other parent. This allows a little more sleep for new parents. If your baby has been asleep for several hours and it is around 11 pm and you are getting ready for bed simply wake baby for a feeding. Most babies wake during the night because they are hungry, so if you feed baby late before you go to bed it is likely they will sleep until early morning or 6-7 hours. This will allow you to get some continuous sleep, even if it is not as much as you want. Thanks for your comments – yes definately have the baby in their nursery for the best sleep for parents or if you decide to share a room – have your baby in a bassinet until about 6 weeks, at this time move them to their own room. Your suggestion on waking for a night feed before the parents bedtime is one technique for night feeding – I suggest you read my book BabyCare: Caring for your Baby 0-6 months this is Plan A for nighttime feeding there is also Plan B. Both will have baby sleeping through the night by 12 weeks. It’s an awesome and challenging job being a parent, isn’t it. Being a mother is not as easy as what many people are thinking of.From its prenatal,mothers are struggling to do things even the weirdest one just to make their babies inside their womb healthy and safe. All of those sacrifices will all worth after giving birth to little angels. Proud to be a parent! Crying is the only way a baby can tell you what they need.With a mother of 2 kids from my experience it’s normal for a baby to cry but sometimes you should be sensitive what’s the cause of crying especially when they are babies. Your baby needs all the care and attention you can give. Just like the song that says “Asking a baby not to cry is just impossible”, I think that parents should know that not all cry are a sign of distress and not should be a reason to panic. The Cry and the Diaper are the two major ways our babies communicate with us. As parents we should be very observant, because we can learn a lot be observing the routines, also cry is the late sign of hunger. The first sign is lip smacking, when you observe this try the rooting reflex and when she goes for that “bait” then the baby is really hungry. It is really hard sometimes to stop babies from crying. In stressful situations when your baby won’t stop crying or won’t respond to you and when you are feeling frustrated, tired and angry you must develop some strategies for taking care of yourself. When you’re calm and centered, you’ll be better able to figure out what’s going on with your child and soothe his or her cries. As days and months pass by, parents and caregivers will be able to know what their baby needs and the reasons behind why they cry. Sure, there will be some days with lack of sleep or none at all, but the thought of being able to contribute to the growth and development of a new life. Thanks for sharing this! 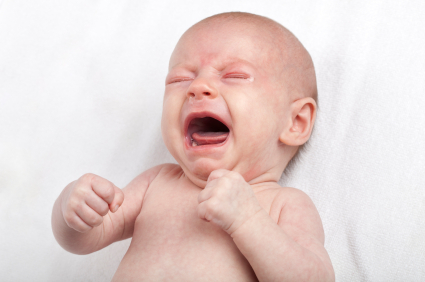 There are Seven reasons babies cry and how to soothe them. Why do babies cry? All babies cry sometimes. It’s perfectly normal. Most small babies cry for between one hour and three hours each day. Your baby can’t do anything for herself and relies on you to provide her with the food, warmth and comfort that she needs. Crying is your baby’s way of communicating any or all of those needs and ensuring a response from you. It’s sometimes hard to work out what your baby is telling you. But in time you will learn to recognise what your baby needs. And as your baby grows she’ll learn other ways of communicating with you. She’ll get better at eye contact, making noises and smiling, all of which reduce her need to cry for attention. In the meantime, if your baby is difficult to soothe, she may be trying to say: I’m hungry, I just feel like crying, I need to be held, I’m tired and need a rest ,I’m too cold or too hot, I need my nappy changing and I need something to make me feel better. So is not easy to have a baby specially for the mother, She’s gave everything for her child.